Affiliated with the multi-award winning Mata Chica Resort on Ambergris Caye, Gaïa Riverlodge (formerly Five Sisters Lodge) delivers the same quality of service, cuisine, ambience and luxury of finish. The result is first class, which is why we are in love with this property. Each of the 16 private cabanas have luxurious touches and are all unique in terms of location, layout and decor. The lodge draws its magic from the property’s natural beauty, situated overlooking spectacular waterfalls located right on the grounds of the lodge. Take a stroll down to the water via the stairs, or hop on their hydro-powered rain forest tram, the only one in Belize. Take a dip in the clear waters of the river, just a stone’s throw away from your cabana, or relax in the sun on the tiny river-island retreat. 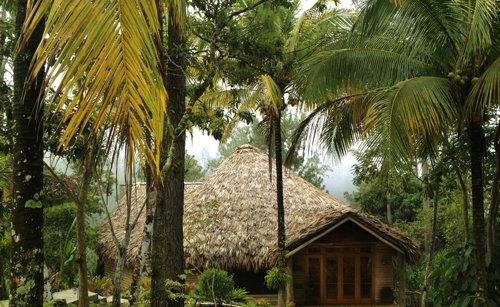 Located in the Mountain Pine Ridge reserve, Gaia Riverlodge is remote and and it’s a spectacular journey through the lush rainforest and pine forests to get there. For this reason, we recommend a minimum stay of 3 nights to make the most of the journey. 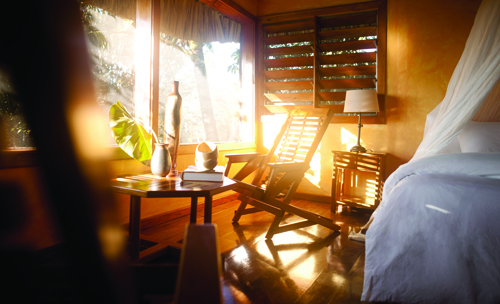 With design features that include Belizean hardwoods, traditional bay leaf thatched roofs and richly varnished mahogany interiors, each of the 16 cabanas are fully screened for comfort, and feature panoramic windows or a private veranda with hammock, ceiling fans, a bathroom decorated with hand-painted Mexican tiles, beds with pillow top mattresses for a great night’s sleep, and Matouk and Frette linens. 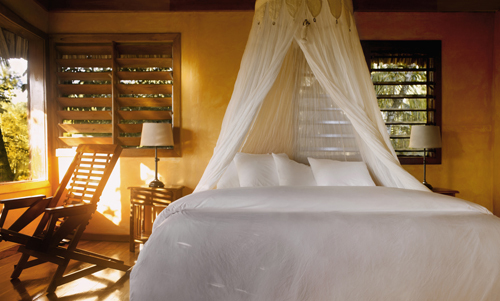 Garden View Cabanas are spacious rooms with views of the tropical Gaïa gardens, with either one king or two queen beds. 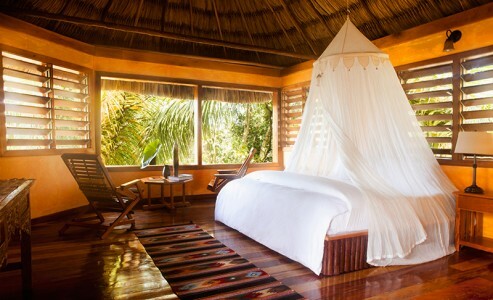 Mountain View Cabanas have views of the green hills of the Maya Mountain Pine Ridge Reserve surrounding the Lodge, with either one king or two queen beds. Waterfall View Cabanas offer a direct view of the falls and are furnished with a king bed. The Waterfall View Suite is a large suite over two floors for couples looking for more luxury and space. It consists of a large bedroom with king bed and private bathroom on the top level, with a living room with open deck and another full bathroom on the lower level. Both rooms have direct view of the waterfalls. For friends traveling together who prefer separate bedrooms, and for families, the living room sofa converts into a queen size bed. The Riverside Villa is a perfect option for those seeking a quiet retreat, being located in a serene, very secluded setting on the banks of Privassion Creek, away from the main lodge. It has one bedroom with a queen bed, and a full bath with a beautifully tiled bathtub. 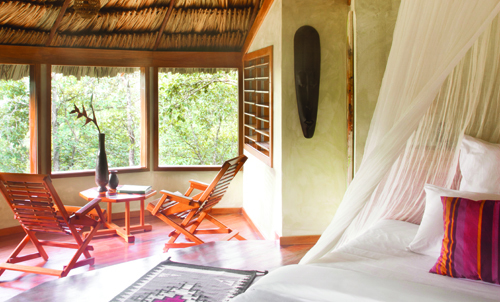 The villa also features hardwood furnishings, its own private kitchen and living room, as well as several screened porches with hammocks and chairs offering a beautiful view of both the jungle and, of course, the river. The rates are in US Dollars and are subject to a 10% service charge and 9% hotel tax. The rates include daily continental breakfast. Extra person in room US$ 35.00 + tax and service charge rack per night. Please note not all rooms can accommodate an extra person. Perfect! – “Don’t be deterred by the long, bumpy road to get here. We stayed 3 nights in March and it was our favorite lodge on our 10 day trip. Landscape, room, staff, food–every detail was perfect. 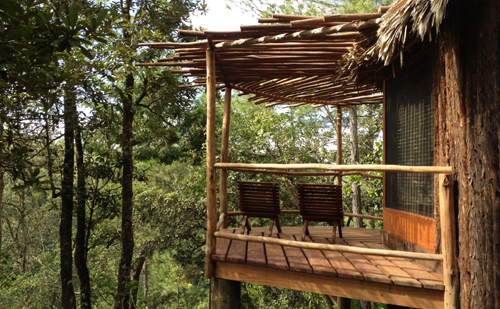 We had the Hopkins junior suite, which is the cabana best situated, private and overlooking the waterfalls. The sound of the falls lulled us to sleep every night. The cabana is large, clean and has a screened porch with chairs and a hammock. We enjoyed breakfast and dinner every night on the wrap around porch of the dining room–watching birds in the morning, looking at stars at night. We did their trip to Caracol–a long day, but well worth it. Also enjoyed the nature trail down to the falls and relaxing in the hammocks next to the river. Appreciated Javier’s advice and tips about the border crossing into Guatemala. We’d recommend without hesitation”. 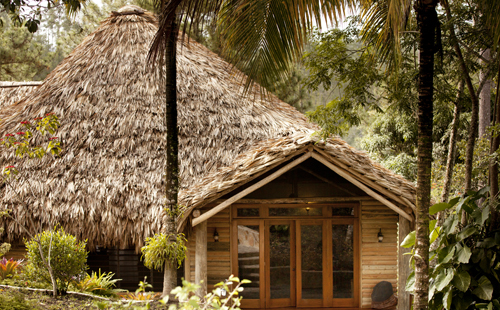 Amazing jungle lodge!!! – “My family of 4 spent 5 nights in the Riverside Villa. I wouldn’t change a thing! Five Sister’s staff, accommodations, and food were absolutely TOP SHELF. If you decide to go, keep in mind that you are MILES out in the jungle and that every item has to be hauled for an hour down torturous, rough roads. Don’t go expecting the Ritz; but DO go. Yes, it’s hot. No, there is no air conditioning. Yes, there are lots of bugs, spiders, mosquitoes, etc. It’s worth it! The remote location is a perfect launchpad for: Caracol, 1000ft Falls, Rios on Pools, Rio Frio Cave, Big Rock, Barton Creek Cave, San Ignacio, Xunantunich, and exploring the Pine Mountain Ridge. Every day we explored far and wide. We always anticipated our return to the cool creek, relaxing in a hammock under the ceiling fans, shower, and a fantastic dinner”.